High Peaks Pure Earth presents the English translation of an online essay titled “Who Is to Blame for the Instability of a Society?” by a Tibetan blogger going by the name of “Zur Sum Ma”* and which was published on the website Korawa on January 12, 2015. In this essay, the author addresses the question of stability in society, a sensitive topic in Tibet and the PRC. The word “stability” is widely associated with former leader Hu Jintao, along with the concept of the “harmonious society” (hexie shehui 和谐社会), and Hu’s obsession with “stability maintenance” (weihu wending 维护稳定, also shortened to weiwen) has been well documented, both in terms of for China and inside Tibet. “Maintaining stability” is a key policy issue in Tibet and it continues to be used to justify high levels of security and restrictions on movements in Tibet. In the China Digital Times Grass Mud-Horse Lexicon’s entry for “Stability Maintenance”, it says: According to the New York Times, the Chinese government budgeted US$111 billion for social stability maintenance in 2012, US$5 billion more than the military budget. In China today, large scale episodes of social unrest are occurring with growing frequency and these are officially defined as “mass incidents”. An unofficial gathering of more than 100 people is recorded as a “mass incident” and the official Annual Report on China’s Rule of Law No 12 (2014) researched 871 mass incidents involving more than 2.2 million people between Jan 1, 2000, and September 30, 2013. However, according to this China Daily article from last year, the research was flawed as it did not take into account any incidents that were only reported on social media. Among the reasons for these “mass incidents” were pollution, labour strikes and forced demolitions. 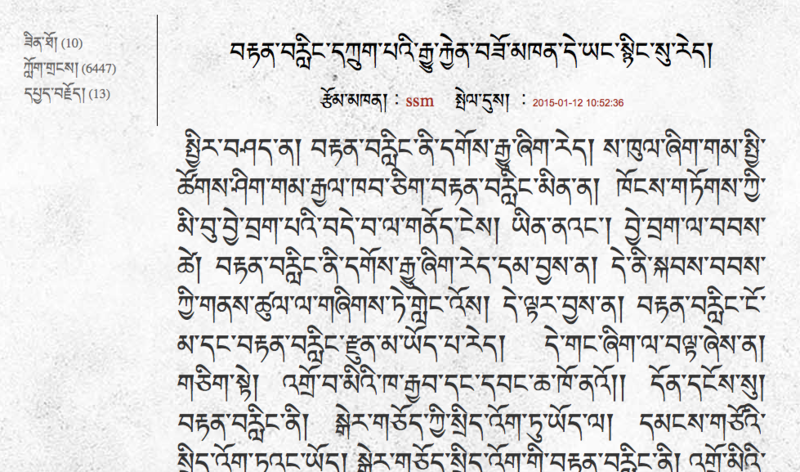 The website Korawa is proving an interesting platform for Tibetan writers and intellectuals. Zur Sum Ma’s outspoken writing style is reminiscent of Shokjang’s, the Tibetan writer whose current whereabouts are unknown. The essay “Man & Freedom” by Buddha was also published on Korawa. Thank you to Dhonling Bhu for the translation from Tibetan to English. Generally speaking, stability is a necessity. If any region, society or country is not stable, then it destroys the happiness of the people who live there. However, when it comes to the individual citizen, is stability necessary? There are two types of stability that can exist: real stability under democratic rule and fake stability under an authoritarian state. Stability under authoritarian rule is through the suppression of people’s freedom and power. But stability under democratic rule is the opposite; it gives people freedom and equality. The leaders ensure stability, not out of a genuine interest for their citizens, but to protect their own power. If a leader loses his power, then he loses the personal benefits that he made from his power. Anger, fear and doubt often stir up instability. In the name of a “harmonious society”, “people’s interests”, “the stability of the country” and “the prosperity of the region”, authoritarian leaders skilfully and deceitfully hide their own interest and fool many people. At some point, citizens would understand their authority’s real deceitful objective while the authorities were speaking about the stability. During that time it is obvious that citizens would react angrily and look down on their leaders. Certainly the younger generation citizens will also spit on their leaders’ face. On the contrary, the leaders were not mindful about this because they were simply infatuated by their personal benefits and cannot reflect on their work. The two types of stability are maintained in different ways. Stability under authoritarian rule is maintained by oppression and by using force on people’s freedom and equality. For example, a leader can maintain stability under authoritarian rule by limiting their citizens’ freedom of speech. However, maintaining stability through deprivation of freedom of expression is unstable and impermanent. Not only that, it also creates cause for instability. Another way a leader can maintain stability is by deceiving citizens with financial favours. For example, whether it is necessary or not, the latter grants help to the citizens to create a positive image of benevolence. In turn, the authorised media makes the citizens seem grateful to the state for its kindness. In fact, whatever money or wealth the state have is owned by the citizens of the country whereas the state doesn’t own anything. Still, the leader explains it by saying, “the country and the government has given financial support to you”. Actually, it is appropriate to receive all this financial support from the government to citizens. Therefore, the citizens need not feel grateful towards the government. In short, the country and government are made up of the citizens. On the other hand, those citizens who receive the most support become the greatest tool to maintain the stability of the country and encourage others to keep the peace. If they feel gratitude towards the leaders, then the door of misfortune will open spontaneously. It is common sense that if someone is grateful, then they will be courteous to their benefactors, and believe in their morality. This blocks “grateful” citizens from feeling doubtful towards their leaders or viewing anything they do as bad. Even if they do identify their actions as bad, they would still not react because of their past good deeds. In that way, the authorities maintain stability because people do not think critically about the authority’s actions, and do not recognise that they are indebted to them. Thus, citizens become part of the problem by helping to oppress the freedom and equality of human beings, including themselves. If the leaders were not fulfilling their goal by deceiving citizens with financial favours peacefully, then they would implement the first method by force and oppression. If citizens would know that their leaders were undermining people’s freedom and power then those citizens would not like them. This also disheartens those citizens. At the beginning there would be only a few citizens who were aware of this, but surely the number would gradually increase more and more. Freedom of speech cannot be stopped by force. There is a Buddhist saying that “the mouth of sentient beings cannot be shut off, even by Buddha.” Moreover, it is without question that people become thoughtful and more aware with the development of society. What we can understand from the above is that maintaining stability while undermining people’s freedom and equality is actually same as maintaining stability while disturbing people’s state of mind. It is merely maintaining stability while creating wounds in the hearts of the people. Authoritarian rulers who have no limits on the ways in which they can control and manipulate their people create instability. In conclusion, the faults and crimes committed by the authoritarian rule are the direct cause of instability by the people. Disrupting the “stability” of people’s state of mind is the first step in creating social instability. If a leader misuses their power, then they will disrupt their people’s state of mind, which then leads to the instability of society. Sometimes I admit that maintaining stability by “suppressing from the top” through condemning people’s freedom and equality is a dangerous and unsure future for the powers that be. In fact, this gathers up the causes of the instability. But for the leaders, they only care about stability during their tenure and feel no responsibility for maintaining stability after their leadership. The next leader would also implement the “suppressing from the top” strategy of power. Perhaps the leaders lack political wisdom and courage to eliminate the causes and conditions of instability. Furthermore, there is a saying that “before ripening the cause of the instability, we have to destroy it completely”. This gives a huge opportunity for the leaders to condemn people’s freedom and power. It also gives the leaders a useful base to claim to destroy the “thorn of the heart” before it ripens. What does “before ripening” mean? How can one measure the difference between ripen and unripe, and what causes instability? Who would know whether a heart is ripened or not yet ripened? Therefore, “maintaining stability” is a direct cause of instability. It is possible to reach a certain point where citizens who are under oppressed and “maintained stability” have no other choice than to disrupt the “stability”. Thus, who is to blame for instability after all? The misuse of power by the authorities hurts the freedom and power of citizens, which leads to the disturbance of people’s mental happiness and ends with its helpless citizens disrupting “the stability” of the country. The authorities put “a cap of crime” on the people’s heads by accusing them of disrupting the stability and harmony of society. Do the authorities feel that citizens will be silenced if they just fulfil their basic needs such as food and shelter? Do the authorities think that the so-called “citizens” will sing “joyous songs” and abandon their freedom and power merely because they are comfortable and fed? Do the authorities think that the so-called “citizens” do not care that someone is stepping on their heads? Also, do they think their citizens will just sit quiet as a mouse, without any opinions of their own? Originally published at http://highpeakspureearth.com/2015/a-tibetan-netizen-asks-who-is-to-blame-for-the-instability-of-a-society/ and republished in TPR with permission.